Some of my favorite childhood memories revolve around family mealtime. I loved gathering with everyone at Gramma’s house for dinner Sunday afternoon, and I love that our door was always open to anyone needing a meal. Schedules are a lot different now than they were when I was growing up. We didn’t have as many after school activities. I was fortunate to sit down with my family almost every night for dinner at 6:00pm. I remember the laughter that took place around our old dining room table and I remember sneaking my lima beans to our dog laying at my feet under the table. (I still don’t like lima beans!) We ate better and we spent quality time together. We talked about our day and what we were looking forward to the next day. As a widowed working mom, it hasn’t always been easy to sit down at the kitchen table every night but I try my best to make dinnertime a priority. 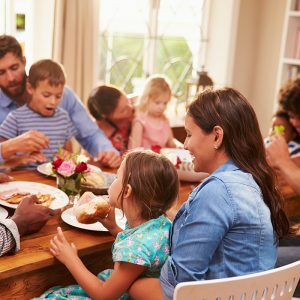 According to statistics, eating dinner together as a family can have significant benefits. Children who eat with their families do better in school, develop healthier eating habits and are less likely to be overweight, have fewer eating disorders, have lower suicide rates, and are less at risk for drug and alcohol use. Stronger family bonds, mutual respect, and a general consideration for each other develops through family mealtime. Here are some mealtime activities that will have everyone in the family looking forward to eating together. Give one or two a try. They are sure to create new, lasting memories and may start some new family traditions! They did for me! Have a “picnic” in the living room. Spread a blanket or tablecloth out on the floor; use paper products or plastic picnicware; serve typical picnic food and add plastic ants for fun. Eat by candlelight and/or use your fine china for an every day meal, not just on a special occasion. Eat dinner backwards. Start with the dessert and end with the appetizer. Each night at dinner, ask everyone at the table what was the most Christ-like thing they did that day, and what was the least Christ-like thing they did that day. Let the kids set a unique table. They can make placemats, place cards, a centerpiece, napkin rings, etc. Let them choose a theme and really get creative! Have everyone speak with an accent during the meal. Put a selection of ingredients on the counter and have the whole family work together to make dinner using only those ingredients. To make things fair, have everyone choose a few of the items that will go on the counter. Have family devotions during dinner. Make a new mealtime tradition for a specific night of the week. Some ideas: Taco Tuesday, Fondu Friday, Family “Date” Night (rent a movie and eat dinner together while you watch the movie), Breakfast for Dinner Night, or Dippy Dinner (everything you serve comes with a dip). Have everyone assemble their own dinner by setting up everything you need for making pizzas, omelets, crepes, burritos, or stir-fry, etc. Each person prepares their own creation and then one family member (of appropriate age) is the chef. Go around the table taking turns sharing where you saw God that day. Have a pajama party. Everyone puts on their silliest pajamas, eats pizza in front of the fireplace, plays Twister, and then eats popcorn while sharing silly stories. As a family, bring dinner to a shut-in and stay and share the meal together. In the morning, select a country, state, city, etc. that has been in the news. Announce the location and then, at dinner, everyone shares what they have discovered about the location. Place a jar or box of questions, topics, etc. on the table. Take turns each night pulling one out of the jar. Spend mealtime discussing what was chosen. Have everyone bring an interesting vocabulary word to the table. See if anyone knows what the words mean. Try to “stump” each other. Categories: Take turns saying a word in a chosen category (music, movies, food, ice cream flavors, names of candy, cities, etc.) or words beginning with the same letter. For example, if the category is music, take turns listing music-related words like “sing,” “note,” “drums,” “concert,” “song title,” etc. Tell a “Chain Story.” One person begins to tell a creative story. After a couple of sentences, the story is “passed” to the person on the right who continues with a few sentences and then passes to the next person on the right… The result will be some very interesting, creative, and silly storytelling. Choose a color of the day. Everyone wears and eats only items of that color. Food Item Day: Eat foods that are made from one food item. For example, if the food was an apple, you would eat, apples, dried apples, baked apples, apple pie, applesauce, candy apples, biscuits with apple butter or apple jelly, apple glazed chicken, etc., and drink apple juice and spiced hot apple cider. Foreign Food Day: Choose one country and eat food from that region all day. For example, if you choose France, have Crépes Suzette or croissants for breakfast, Coq Au Vin for dinner, etc. You can turn this into a family educational experience by having each person research different things about the country to share during dinner. Younger kids can make props like drawing and coloring the countries’ flag. Instead of choosing a country, make up your own! Together, decide where your country is located, what foods they would eat, what the weather is like, what is the standard mode of transportation, what their words are for certain items, what the houses look like, etc. Create a menu to go with your country and let everyone help with the preparations. Make the most of family time around the kitchen table. When I think back on my childhood I don’t necessarily remember what I wore on the first day of school or what I got for my 10th birthday, but I so remember the sweet faces and giggles that filled our dinner hour. These memories will last a lifetime.